Parents and caregivers have long been told to place children in the rear row of a vehicle to reduce the risk of harm from an airbag. 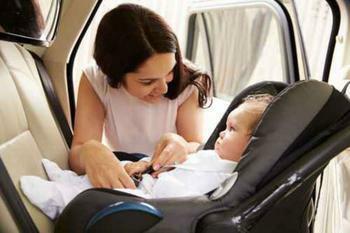 However, there’s a danger in placing kids in the rear seat that many adults may not know about. With regard to the rear row placement of infants and small children, there is a safe side and a not-so-safe side. The CAS believes more parents should know that placing kids behind an occupied front seat could be dangerous. The petition states that kids should be placed behind an unoccupied front seat or behind the lightest occupant. This is because, in the event of a crash, adults may collapse rearward causing severe injury to the child sitting behind them. "In all too many cases, the parents are in the front seat with the heavier father driving so that the lighter mother can watch and tend to the child,” Clarence Ditlow, executive director of CAS, wrote in a letter to the NHTSA. The Center for Auto Safety says injuries due to weak front seats and seatbacks are more common than the NHTSA thinks. Since the 1990s, nearly 900 rear-seated children have died in rear-impact collisions. Studies show that kids can be crushed by front-seat occupants if drivers are traveling at any speed above 30 miles per hour. Fatal injuries due to seatback failure can lead to a lifetime of sorrow. Parents Liz and Andrew Warner lost their 17-month-old daughter, Taylor, to a rear-end collision while driving their 2010 Honda Odyssey. Ditlow says that until cars are "equipped with adequately strong front seats and seatbacks, children in rear seats behind occupied front seats will continue to be in danger of death or severe injury from front seatback failures in rear-end impacts."